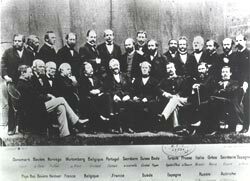 Today in 1865, the first International Telegraph Convention was signed in Paris by the 20 founding members, and the International Telegraph Union (ITU) was established to facilitate subsequent amendments to this initial agreement. The total number of SMS sent globally tripled between 2007 and 2010, from an estimated 1.8 trillion to a staggering 6.1 trillion. In other words, close to 200,000 text messages are sent every second. Assuming an average cost of $0.07 per SMS, in 2010 SMS traffic is generating an estimated $812,000 every minute (or around $14,000 every second). This entry was posted in Information Economy, Statistics, Telegraph, Telephone, The Information Business, This day in information. Bookmark the permalink.